Of interest was I had a fall where a ski came off. Putting them back on, I must have switched skis and the result was one ski just had no edge holding power. Switched skis, everything was fine...came home and did some edge work. The resulting clean smooth edges were far better than the original factory tune. I should have known better than to ski the factory tune and should have worked the edges prior to going out on day one. The management of the Living Proof organization regretfully announces that Mr. Proof is an idiot and is barred from future mounting of skis. It also wishes to apologize to the Head Ski Corp. for any smears of their ski tuning process. Upon investigation of Mr. Proof's ski bindings, it was ascertained that he placed the binding on one ski in a position far, far forward of center, like about 5 cm. To his great relief, the bindings are adjustable, the basic track position is in the correct location, and a few turns with a screw driver corrected his error. With errors corrected, the skis do, indeed, ski fine. I've actually been thinking of taping a piece of paper on my skis that tells me where the toepiece and the heel piece should be mounted. Your anecdote may be "living proof" that this is a good idea. I've actually been thinking of taping a piece of paper on my skis that tells me where the timepiece and the heel piece should be mounted. You're anecdote may be "living proof" that this is a good idea. You have a watch on your skis? Time for an update following 6 days on the Rev 85 in the west. First and foremost, my thinking and prior posts about the Head Rev 85 were influenced by a binding issue that was not fully discovered until this trip. I put Marker Jester adjustable bindings on the ski: the bindings were used on a former ski with no problem. I found out, the hard way (falling), that the toepiece of one ski kept moving forward as it was skied: not staying in correct adjustment after a few runs. I did not realize this at first and kept moving the heel forward to restore forward pressure. The net effect was the tail of one ski would slide out in the rear and not hold edge. I had new Look bindings put on them during the trip. First, the are competent carvers, I could lay tracks on some harder western snow, but, it is much better at "on the line" as opposed to my initial +1 cm binding location. This is different from what others found on previous Head skis such as the Peak series. As the Rev 85 has a small rocker tip, my thinking is this reduces the effective length and makes the center point a better location. There is a marked difference between skiing the two points...trust me on that one. They also have no speed limit at the speeds I am willing to take them. Having said that, skiing with the Epic Gathering group, proves I ski at moderate speed compared to most. In soft snow bumps, and in some bump-tree runs, they are also competent. The tips are a little stiff, but, the better I became in bumps, the better they perform.....no surprise there. Did not get to ski them in any fresh powder, other than a day at Jackson Hole where there was some broken, day old stuff. The light was very flat, which is an issue as my confidence is diminished in those conditions. Also, I did experience binding pre-release issues that day, so, throw out that day as a data point. I did find that they respond to good technique, and, noticed that, when they seemed sloppy, I could change that with better attention to a solid release from the old turn and bringing them to a better edge. Some may remember my concern about knee pain from skiing so many days in a row, and, I'm happy to state the Rev's permitted me ski without pain. Knees feel much better than they did upon return from Tahoe last winter. In summary, I got a solid 1 ski quiver for western trips. Thumbs up to the Head Rev 85. BTW, the Rev's are now in California with Philpug, who will put a Tyrolia plate on them, so that my new bindings can be reset at center. The holes from the initial mount did not permit the Looks to be mounted on-the-line, so, the Tyrolia plate will allow for this position. Nice review Mike...sounds like after the initial mishaps and launching, you've got the binding location worked out. What length did you ski it in? That new binding and plate will certainly quicken up the edge to edge movements and for carving, that will be sweet. 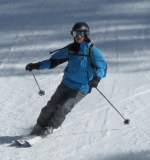 Glad to hear too that you enjoyed the ski without knee pain. So glad you've got your 1 quivver out west ski nailed.....sure makes traveling easier. Phil called the other day and told me that he can move the bindings w/o a plate (via using the helix hole inserts), so, no plate. It was a long, strange trip to get them straightened out. It's very easy, looking back, to realize how small differences in binding location make a big difference in how a ski performs. Do you know if our friend from the NY trip (forget his first name) have his new Rev 85's mounted at center, which is where I like them? It's also a little strange that you find the 105's 2+ cm forward to be best, while I did not like that position at all on the 85's. I'm thinking some of that difference is attributed to boot size as you ski on a much shorter boot. My foot's "love pad" would be more to the front of a boot than yours.